10 mile long run that was accidentally progressive. First mile in about 7:50 or so and just naturally rolled all the way down to ~6:10 the last couple of miles. Never really felt like I was pushing the pace and it was amazing. This run + a decent meet on Thursday has me thinking I’m back on track. saturday: 23 miles with 3000ft climbing. hung on for my buddy’s steady state workout, so some good quality there as well. averaged 6:59 for the whole run. sunday: 16 miles super chill. 80 miles on the week. biggest in quite some time. last big workout tomorrow before the taper starts in earnest! Easy workout today. Just shaking the legs out after a car ride. Harder workout coming Wednesday followed by lots of racing. Took Sunday off after the LR, felt awesome today. Recovery was long but still a good workout. Was absolutely cruising on the 400s and 300s, which was nice. I actually said “wait really?” when we crossed the line on the 2nd 400 because I thought we were slow. I felt a bit overcooked toward the end. Good effort. felt solid. that was the last big workout before boston. now i just have to be not stupid. That’s an impressive workout @afv . You are certainly an aerobic monster. I’m not sure that many can grasp how difficult that is on such short rest. It appears that you’re ready. Won the 800 at out home meet this weekend in 1:57.1. Wasn’t a fast race, but for a season opener in 35° weather it wasn’t bad. It was also a field with a few pretty decent athletes and I haven’t been feeling 100% lately so I was pleased. First time with spikes since October! Haikkola and Viren did many variations of this session including his 50m hard/50m moderate x 50 for 5000m in 13:30 before Montreal. had a little back flareup on weds/thurs/fri due to my daughter growing and her only wanting to fall asleep with her head on my left side while we walk around. but stretched a lot and saw my PT on thursday. managed to get it worked out for the most part (knock on wood). went into saturday’s run ready to bail if the back gave me any issues but it felt pretty solid except for a little tightness in the lower part. 13 miles with 2000ft climbing felt solid. sunday was nice and easy 8 miles with a massage afterwards. seeing my PT today and thursday again to get things hopefully fully sorted before boston on monday. Managed to squeeze in a back to back long run this weekend. 13.25 miles Saturday avg 6:18 pace with a few hills about 500 ft or so and two miles at 5:30 pace towards the end. . Ran 11 Sunday along the same route avg 6:29 pace. Both runs felt really good. Definitely a big fan of the epic react though. Racing a half marathon next weekend, and today I did my last long session. 10 mile progression on the turf starting at 5:43 and getting down to about 5:05. Ended up running right at 54:00 for 10. Last 5 miles was about a 5:15 average. Treated this as a race simulation. Wore vaporflys and my kit, and I woke up early to eat a good breakfast. Felt really relaxed through the first 6-7 miles and didn’t feel like I was working that hard until the last 1.5-2 miles. Definitely a big confidence booster knowing that I can run right around goal pace for 10 miles. Betting that you average 5.15/mile for the entire 13.1. That workout seems to indicate that in my mind. Only you know, however. Coach seemed to also think that I was in sub-70 shape in the right race on the right day. Honestly, I would be thrilled with a 1:10 or 1:11 here. Star Wars half isn’t too deep, so I just want to try and finish in that top 3. Going to just try and compete, and I figure the time will come. I graduated in December after having a pretty miserable college career full of injuries (2 femoral stress fractures, 1 sacral stress fracture, and 1 horribly tight piriformis) that really hindered my ability to be consistent. I honestly thought I was going to quit running after I graduated, but I found a few post-collegiate guys in town to run with and found my love for running again. I run a lot easier on distance runs (~7:15-7:45) and just do a lot of long alternating pace sessions or float workouts. Mileage has really only been 60-65 with a day off every week. It seems to really be working for me again. More importantly, I am having fun again! Went at the 500 too relaxed, but a decent workout overall. @Samminer94 fun is good! it’s much easier to get fit and run fast when you’re enjoying it. i was the same way after college - totally burned out and had more injuries than i thought necessary (tibial stress fracture, knee surgery). it took me almost a year to get my mojo back but once you find the right group and reasons, it all clicks and it hasn’t stopped for me yet! good luck in the half. you’re fit. run comfortable. Thanks! I completely agree. If it’s fun, then running fast and everything else is just a bonus. It definitely depends on what kit you’re wearing, but I find it hard to match the crimson 4%s with anything I own. I wore powder blue in January when I wore a 2017 singlet and some navy shorts, and that matched well. That is the only pair that I have run in thus far and they’ve got a little less than 50 miles since I picked them up in November. 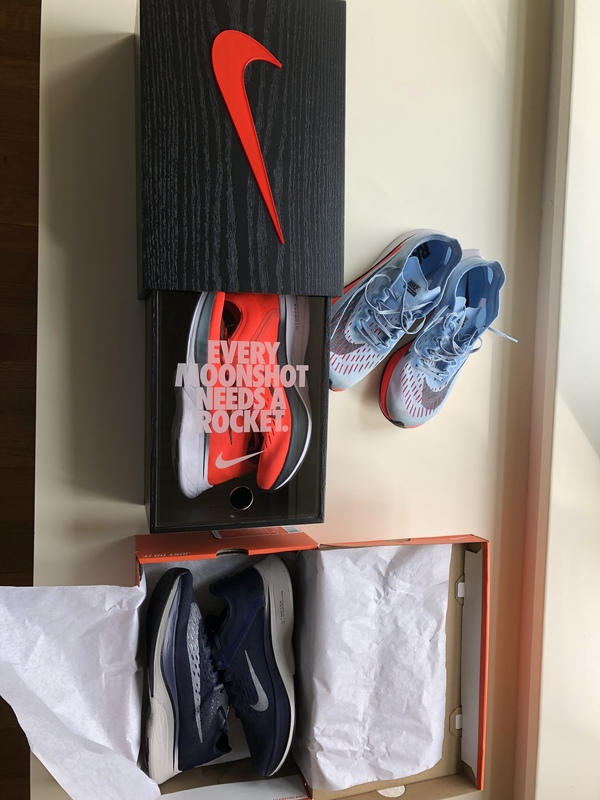 I’ve definitely got a bit of a Vaporfly problem.